The overseas interests and areas of the world that at one time were territories of the Portuguese Empire (diachronic). a. ^ The capital was de facto located in Rio de Janeiro from 1808 to 1821. Over the following decades, Portuguese sailors continued to explore the coasts and islands of East Asia, establishing forts and factories as they went. By 1571, a string of naval outposts connected Lisbon to Nagasaki along the coasts of Africa, the Middle East, India and South Asia. This commercial network brought great wealth to Portugal. 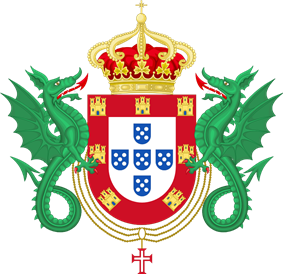 When Philip II of Spain, I of Portugal, inherited the Portuguese crown in 1580, this began a 60-year union between Spain and Portugal that has since been given the historiographic term of the Iberian Union. Though the realms continued to be administered separately, the Council of Portugal ruled the country and its empire from Madrid. As the King of Spain was also King of Portugal, Portuguese colonies became the subject of attacks by three rival European powers hostile to Spain: the Dutch Republic, England, and France. With its smaller population, Portugal was unable to effectively defend its overstretched network of trading posts, and the empire began a long and gradual decline. 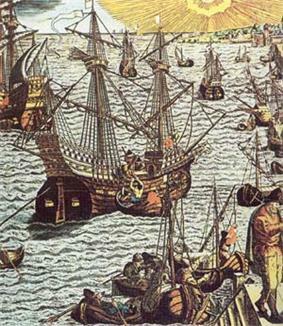 Eventually, significant losses to the Dutch in Portuguese India and Southeast Asia during the 17th century brought an end to the Portuguese trade monopoly in the Indian Ocean. Brazil became the most valuable colony of the second era until, as part of the wave of independence movements that swept the Americas during the early 19th century, it broke away in 1822. The third era represents the final stage of Portuguese colonialism after the decolonization of the Americas of the 1820s. The colonial possessions had been reduced to the African coastline (expanded inland during the Scramble for Africa in the late 19th century), Portuguese Timor, and enclaves in India (Goa) and China (Macau). The disastrous 1890 British Ultimatum led to the contraction of Portuguese ambitions in Africa. Under António Salazar, the Second Portuguese Republic made some ill-fated attempts to hold on to its last remaining colonies and overseas provinces after the 1961 Indian annexation of Goa, embarking on the Portuguese Colonial War in Africa which lasted until the final overthrow of the regime in the Carnation Revolution of 1974. 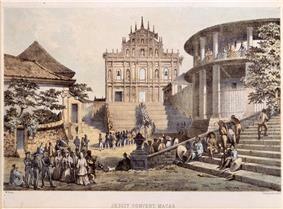 Macau was returned to China in 1999 and East Timor was given independence in 2002. The origin of the Kingdom of Portugal lay in the reconquista, the gradual reconquest of the Iberian peninsula from the Moors. After establishing itself as a separate kingdom in 1139, Portugal completed its reconquest of Moorish territory by reaching Algarve in 1249, but its independence continued to be threatened by neighbouring Castile until the signing of the Treaty of Ayllón in 1411. Although Ceuta proved to be a disappointment for the Portuguese, the decision was taken to hold it while exploring along the Atlantic African coast. A key supporter of this policy was Infante Dom Henry the Navigator, who had been involved in the capture of Ceuta, and who took the lead role in promoting and financing Portuguese maritime exploration until his death in 1460. At the time, Europeans did not know what lay beyond Cape Bojador on the African coast. Henry wished to know how far the Muslim territories in Africa extended, and whether it was possible to reach Asia by sea, both to reach the source of the lucrative spice trade and perhaps to join forces with the fabled Christian kingdom of Prester John that was rumoured to exist somewhere in the "Indies". Under his sponsorship, soon the Atlantic islands of Madeira (1420) and Azores (1427) were reached and started to be settled producing wheat to export to Portugal. Fears of what lay beyond Cape Bojador, and whether it was possible to return once it was passed, were assuaged in 1434 when it was rounded by one of Infante Henry's captains, Gil Eanes. Once this psychological barrier had been crossed, it became easier to probe further along the coast. In 1443 Infante Dom Pedro, Henry's brother, granted him the monopoly of navigation, war and trade in the lands south of Cape Bojador. Later this monopoly would be enforced by the Papal bulls Dum Diversas (1452) and Romanus Pontifex (1455), granting Portugal the trade monopoly for the newly discovered lands. A major advance which accelerated this project was the introduction of the caravel in the mid-15th century, a ship that could be sailed closer to the wind than any other in operation in Europe at the time. Using this new maritime technology, Portuguese navigators reached ever more southerly latitudes, advancing at an average rate of one degree a year. Senegal and Cape Verde Peninsula were reached in 1445. The first feitoria trade post overseas was established in 1445 on the island of Arguin off the coast of Mauritania, to attract Muslim traders and monopolize the business in the routes travelled in North Africa. In 1446, Álvaro Fernandes pushed on almost as far as present-day Sierra Leone and the Gulf of Guinea was reached in the 1460s. Expansion of sugarcane in Madeira started in 1455, using advisers from Sicily and (largely) Genoese capital to produce the "sweet salt" rare in Europe. 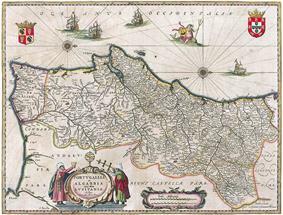 Already cultivated in Algarve, the accessibility of Madeira attracted Genoese and Flemish traders keen to bypass Venetian monopolies. Slaves were used, and the proportion of imported slaves in Madeira reached 10% of the total population by the 16th century. "By 1480 Antwerp had some seventy ships engaged in the Madeira sugar trade, with the refining and distribution concentrated in Antwerp. By the 1490s Madeira had overtaken Cyprus as a producer of sugar." The success of sugar merchants such as Bartolomeo Marchionni would propel the investment in future travels. In 1469, after prince Henry's death and as a result of meagre returns of the African explorations, King Equator was crossed by navigators sponsored by Fernão Gomes in 1473 and the Congo River by Diogo Cão in 1482. It was during this expedition that the Portuguese first encountered the Kingdom of Kongo, with which it soon developed a rapport. During his 1485–86 expedition, Cão continued to Cape Cross, in present-day Namibia, near the Tropic of Capricorn. As the Portuguese explored the coastlines of Africa, they left behind a series of padrões, stone crosses engraved with the Portuguese coat of arms marking their claims, and built forts and trading posts. From these bases, they engaged profitably in the slave and gold trades. Portugal enjoyed a virtual monopoly on the African seaborne slave trade for over a century, importing around 800 slaves annually. Most were brought to the Portuguese capital Lisbon, where it is estimated black Africans came to constitute 10 per cent of the population. The 1494 Treaty of Tordesilhas meridian divided the world between the crowns of Portugal and of Castile. In 1492 Christopher Columbus's discovery for Spain of the New World, which he believed to be Asia, led to disputes between the Spanish and Portuguese. These were eventually settled by the Treaty of Tordesilhas in 1494, which divided the world outside of Europe in an exclusive duopoly between the Portuguese and the Spanish along a north-south meridian 370 leagues, or 970 miles (1,560 km), west of the Cape Verde islands. However, as it was not possible at the time to correctly measure longitude, the exact boundary was disputed by the two countries until 1777. The squadron of Vasco da Gama left Portugal in 1497, rounded the Cape and continued along the coast of East Africa, where a local pilot was brought on board who guided them across the Indian Ocean, reaching Calicut (the capital of the native kingdom ruled by Zamorins) in south-western India in May 1498. The second voyage to India was dispatched in 1500 under Pedro Álvares Cabral. While following the same south-westerly route as Gama across the Atlantic Ocean, Cabral made landfall on the Brazilian coast. This was probably an accidental discovery, but it has been speculated that the Portuguese secretly knew of Brazil's existence and that it lay on their side of the Tordesillas line. 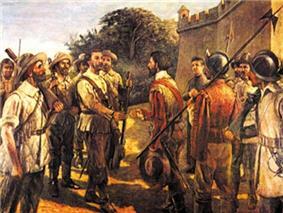 Cabral recommended to the Portuguese King that the land be settled, and two follow up voyages were sent in 1501 and 1503. 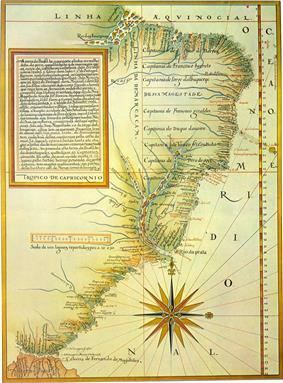 The land was found to be abundant in pau-brasil, or brazilwood, from which it later inherited its name, but the failure to find gold or silver meant that for the time being Portuguese efforts were concentrated on India. In 1502, to enforce its trade monopoly over a wide area of the Indian Ocean, the Portuguese Empire created the cartaz licensing system, granting merchant ships protection against pirates and rival states. In 1506 a Portuguese fleet under the command of Tristão da Cunha and Afonso de Albuquerque, conquered Socotra at the entrance of the Red Sea and Muscat in 1507, having failed to conquer Ormuz, following a strategy intended to close off commerce to and from to the Indian Ocean. Madagascar was partly explored by Cunha and in the same year Mauritius was discovered by Cunha whilst possibly being accompanied by Albuquerque. After the capture of Socotra, Cunha and Albuquerque operated separately. While Cunha traveled India and Portugal for trading purposes, Albuquerque went to India to take over as governor after Almeida's three-year term ended. Almeida refused this and soon place Albuquerque under house arrest, and remained there until 1509. Although requested by Manuel I to further explore interests in Malacca and Sri Lanka, Almeida instead focused on western India, in partiuclar the Sultanate of Gujarat due to his suspicions of traders from the region possessing more power. The Mamlûk Sultanate sultan Al-Ashraf Qansuh al-Ghawri along with the Gujurati sultanate attacked Portuguese forces in the harbor of Chaul that resulted in the death of Almeida's son. 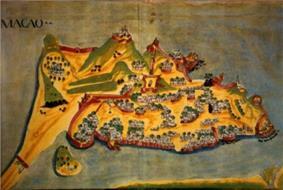 In retaliation, the Portuguese fought the Mamluks and Gujurati fleets in the sea Battle of Diu in 1509. ^ NavigationsThe Presence of the "Portugals" in Macau and Japan in Richard Hakluyt's ", Rogério Miguel Puga, Bulletin of Portuguese/Japanese Studies, vol. 5, December 2002, pp. 81–116. For instance, as Portuguese merchants were presumably the first to introduce the Amharic birtukan. Also, in southern Italian dialects (e.g., Neapolitan), an orange is portogallo or purtuallo, literally "(the) Portuguese (one)", in contrast to standard Italian arancia. Today, Portuguese is one of the world's major languages, ranked sixth overall with approximately 240 million speakers around the globe. It is the third most spoken language in the Americas, mainly due to Brazil, although there are also significant communities of lusophones in nations such as Canada, the USA and Venezuela. In addition, there are numerous Portuguese-based creole languages, including the one utilized by the Kristang people in Malacca. Eight of the former colonies of Portugal have Japan, Mauritius, Namibia, Senegal, and Turkey. Moreover, twelve candidate countries or regions have applied for membership to the CPLP and are awaiting approval. Currently, the Azores, Madeira and Savage Islands are the only overseas territories that remain politically linked to Portugal. Although Portugal began the process of decolonizing East Timor in 1975, Macau during 1999–2002 was sometimes considered Portugal's last remaining colony, as the Indonesian invasion of East Timor and resulting occupation were not internationally recognized. Macau was returned to China on December 20, 1999, under the terms of an agreement negotiated between People's Republic of China and Portugal twelve years earlier. Nevertheless, the Portuguese language remains co-official with Cantonese Chinese in Macau. Presently, the intergovernmental successor of the Empire. In March 1987, Portugal signed the Sino-Portuguese Joint Declaration with the People's Republic of China to establish the process and conditions for the transfer of sovereignty of Macau, its last remaining colony. While this process was similar to the agreement between the United Kingdom and China two years earlier regarding Hong Kong, the Portuguese transfer to China was met with less resistance than that of Britain and Hong Kong, as Portugal had already recognized Macau as Chinese territory under Portuguese administration in 1979. Under the transfer agreement, Macau is to be governed under a one country, two systems policy, in which it will retain a high degree of autonomy and maintain its capitalist way of life for at least 50 years after the handover in 2049. The handover on 20 December 1999 officially marked the end of the Portuguese Empire and end of colonialism in Asia. East Timor also declared independence in 1975 by making an exodus of many Portuguese refugees to Portugal, which was also known as retornados. However, East Timor was almost immediately invaded by neighbouring Indonesia, which later occupied up until 1999. A United Nations-sponsored referendum of that year resulted in a majority of East Timorese choosing independence, which was finally achieved in 2002. Civil wars in Angola and Mozambique promptly broke out, with incoming communist governments formed by the former rebels (and backed by the Soviet Union, Cuba, and other communist countries) fighting against insurgent groups supported by nations like Zaire, South Africa, and the United States. In the wake of World War II, decolonization movements began to gain momentum in the empires of the European powers. The ensuing Cold War also created instabilities among Portuguese overseas populations, as the United States and Soviet Union vied to increase their spheres of influence. Following the granting of independence to India by Britain in 1947, and the decision by France to allow its enclaves in India to be incorporated into the newly independent nation, pressure was placed on Portugal to do the same. This was resisted by António de Oliveira Salazar, who had taken power in 1933. 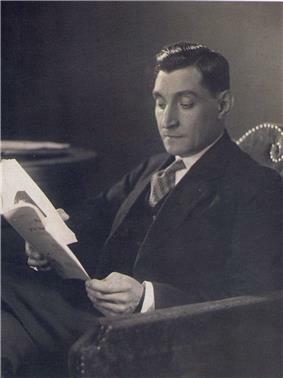 Salazar rebuffed a request in 1950 by Indian Prime Minister Jawaharlal Nehru, to return the enclaves, viewing them as integral parts of Portugal. The following year, the Portuguese constitution was amended to change the status of the colonies to overseas provinces. In 1954, a local uprising resulted in the overthrow of the Portuguese authorities in the Indian enclave of Dadra and Nagar Haveli. The existence of the remaining Portuguese colonies in India became increasingly untenable and Nehru enjoyed the support of almost all the Indian domestic political parties as well as the Soviet Union and its allies. In 1961, shortly after an uprising against the Portuguese in Angola, Nehru ordered the Indian Army in to Goa, Daman and Diu, which were quickly captured and formally annexed the following year. Salazar refused to recognize the transfer of sovereignty, believing the territories to be merely occupied. 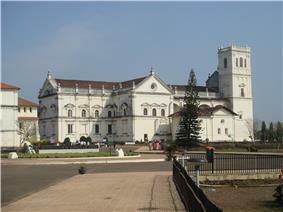 The Province of Goa continued to be represented in the Portuguese National Assembly until 1974. In 1914, the German Empire formulated plans to usurp Angola from Portuguese control. Skirmishes between Portuguese and German soldiers ensued, resulting in reinforcements being sent from the mainland. The main objective of these soldiers was to recapture the Kionga Triangle, the territory having been subjugated by Germany. In 1916, after Portugal interned German ships in Lisbon, Germany declared war on Portugal. Portugal followed suit, thus entering World War I. Early in the war, Portugal was involved mainly in supplying the Allies positioned in France. In 1916, there was only one attack on the Portuguese territory, in Madeira. In 1917, one of the actions taken by Portugal was to assist England in its timber industry, imperative to the war effort. Along with the Canadian Forestry Corps, Portuguese personnel established logging infrastructure in an area now referred to as the "Portuguese Fireplace". Throughout the year, Portugal dispatched contingents of troops to the Allied front in France. Midway in the year, Portugal suffered its first WWI casualty. Meanwhile, in Portuguese Africa, Portugal and the British fought numerous battles against the Germans in both Mozambique and Angola. Later in the year, U-boats entered Portuguese waters again and, once more, attacked Madeira, and sunk multiple Portuguese ships. Through the beginning of 1918, Portugal continued to fight along the Allied front against Germany, including participation in the infamous Battle of La Lys. As autumn approached, Germany found success in both Portuguese Africa, and against Portuguese vessels, sinking multiple ships. After nearly three years of fighting (from a Portuguese perspective), WWI ended, with an armistice being signed by Germany. At the Versailles Conference, Portugal regained control of all its lost territory, but did not retain possession (by the principle of uti possidetis) of territories gained during the war, except for Kionga, a port city in modern-day Tanzania. The King's reaction to the ultimatum was exploited by republicans. In 1908 King Carlos and Prince Luís Filipe were murdered in Lisbon. Luís Filipe's brother, Manuel, became King Manuel II of Portugal. Two years later he was overthrown and Portugal became a republic. In 1808, Napoleon Bonaparte invaded Portugal, and Dom João, Prince Regent in place of his mother, Dona Maria I, ordered the transfer of the royal court to Brazil. In 1815 Brazil was elevated to the status of Kingdom, the Portuguese state officially becoming the United Kingdom of Portugal, Brazil and the Algarves (Reino Unido de Portugal, Brasil e Algarves), and the capital was transferred from Lisbon to Rio de Janeiro, the only instance of a European country being ruled from one of its colonies. 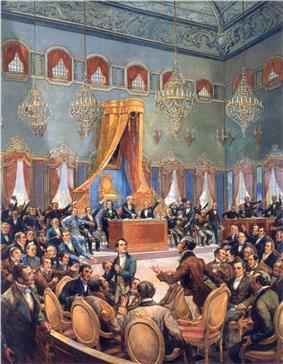 There was also the election of Brazilian representatives to the Cortes Constitucionais Portuguesas (Portuguese Constitutional Courts), the Parliament that assembled in Lisbon in the wake of the Liberal Revolution of 1820. Encouraged by the example of the United States of America, which had won its independence from Britain, the attempt centred in the colonial province of Minas Gerais was made in 1789 to achieve the same objective. However, the Inconfidência Mineira failed, the leaders arrested and, of the participants of the insurrections the one of lowest social position, Tiradentes, was hanged. Among the conspiracies led by the Afro- population was the Bahian revolt in 1798, led primarily by Joao de Deus do Nascimento. Inspired by the French Revolution, leaders proposed a society without slavery, food prices would be lowered, and trade restriction abolished. Impoverished social conditions and a high cost of living were among reasons of the revolt. The plot was diffused before major action began, and four of the conspirators were executed and several others were exiled on the Atlantic Coast of Africa. Several more smaller-scale slave rebellions and revolts would occur from 1801 and 1816 and fears within Brazil were that it would become a "second Haiti". Unlike Spain, Portugal did not divide its colonial territory in America. The captaincies created there were subordinated to a centralized administration in Salvador which reported directly to the Crown in Lisbon. 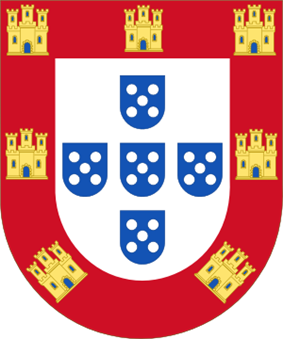 The 18th century was marked by increasing centralization of royal power throughout the Portuguese empire. The Jesuits, who were protective of the Indians against slavery, were brutally suppressed by the Marquis of Pombal that lead to the dissolution of the order in the region by 1759. Pombal wished to improve the status of the natives by declaring them free and increase the mestizo population by encouraging intermarriage between them and the white population. Indigenous freedom was hampered in contrast to the Jesuits, and response to intermarriage was lukewarm at best. The crown's revenue from gold was in decline and plantation revenue was on the rise by the time of Pombal, and he made provisions to improve each. Although he failed to spike the gold revenue, two short-term companies he established for the plantation economy saw the increase in production of cotton, rice, cacao, tobacco, sugar. Cotton, cacao, and rice saw a significant rise in importance in the second half of the 18th century. Slave labor increased as well as involvement from the textile economy. The economic development as a whole was inspired by elements of the Enlightenment in mainland Europe. However, the diminished influence from states such as the United Kingdom increased the Kingdom's dependence upon Brazil. Gold discovered in Mato Grosso and Goais sparked an interest to solidify the western borders of the colony. In the 1730s contact with Spanish outposts were more frequent, and the Spanish threatened to launch a military expedition in order to remove them. This failed to occur and by the 1750s the Portuguese were able to implant a political stronghold in the region. Africans and Afro-Brazilians were the largest group of people in Minas Gerais. Slaves labeled as 'Minas' and 'Angolas' were in high demand during the boom, and there was a preference toward Akan in the 'Minas' group who were reputed to have been experts in extrapolating gold in their native regions. In spite of the high death rate associated with the slaves involved in the mining industry, the owners that allowed slaves that extracted above the minimum amount of gold to keep the excesses, which in turn led to the possibility of manumission. Those that were free were in artisan jobs such as cobblers, tailors, and blacksmiths. In spite of free blacks and mulattoes playing a large role in Minas Gerais, the number of them that were marginalized was greater there than in any other region in Brazil. The gold rush considerably increased the revenue of the Portuguese crown, who charged a fifth of all the ore mined, or the "fifth". Diversion and smuggling were frequent, along with altercations between Paulistas (residents of São Paulo) and Emboabas (immigrants from Portugal and other regions in Brazil), so a whole set of bureaucratic controls were instituted beginning in 1710 with the captaincy of São Paulo and Minas Gerais. By 1718, São Paulo and Minas Gerais were two captaincies, with eight vilas created in the latter. The crown also restricted the diamond mining within its jurisdiction and to private contractors. In spite of gold galvanizing global trade, the plantation industry was the leading export for Brazil during this period; sugar constituted at 50% of the exports (with gold at 46%) in 1760. From 1693 the focus was in a Brazilian region that become known as Minas Gerais, where gold was discovered. Major discoveries of gold and, later, diamonds in Minas Gerais, Mato Grosso and Goiás led to a "gold rush", with a large influx of migrants. The village became the new economic center of the empire, with rapid settlement and some conflicts. This gold cycle led to the creation of an internal market and attracted a large number of immigrants. By 1739, at the apex of the mining boom, the population of Minas Gerais was somewhere between 200,000 to 250,000. The loss of colonies was one of the reasons that contributed to the end of the personal union with Spain. In 1640 John IV was proclaimed King of Portugal and the Portuguese Restoration War began. In 1661 the Portuguese offered Bombay and Tangier to England as part of a dowry, and over the next hundred years the English gradually became the dominant trader in India, gradually excluding the trade of other powers. In 1668 Spain recognized the end of the Iberian Union and in exchange Portugal ceded Ceuta to the Spanish crown. Meanwhile, in the Arabian Peninsula, the Portuguese also lost control of Ormuz by a joint alliance of the Safavids and the English in 1622, and the Omani would capture Muscat in 1650. They would continue to use Muscat as a base for repetitive incursions within the Indian Ocean, including capturing Fort Jesus in 1698. The Dutch took their fight overseas attacking Spanish and Portuguese colonies, beginning the Brazil and Luanda, but the Portuguese regained these territories. The Dutch eventually realized the importance of Goa in breaking up the Portuguese empire in Asia. In 1583, merchant and explorer Jan Huyghen van Linschoten (1563 – 8 February 1611), formerly the Dutch secretary of the Archbishop of Goa, had acquired information while serving in that position that contained the location of secret Portuguese trade routes throughout Asia, including those to the East Indies and Japan. It was published in 1595; the text was then included in the larger volume published in 1596 under the title "Itinerario: voyage, ofte schipvaert van Jan Huygen van Linschoten naer Oost ofte Portugaels Indien, 1579–1592, Volume 2, Issue 2, by Jan Huygen van Linschoten, Linschoten-Vereeniging (Hague, Netherlands)". Dutch and English interests used this new information, leading to their commercial expansion, including the foundation of the English East India Company in 1600, and the Dutch East India Company in 1602. These developments allowed the entry of chartered companies into the East Indies. Spanish imperial trade networks now were opened to Portuguese merchants, which was particularly lucrative for Portuguese slave traders who could now sell slaves in Spanish America at a higher price than could be fetched in Brazil. In addition to this newly acquired access to the Spanish asientos, the Portuguese were able to solve their bullion shortage issues with access to the production of the silver mining in Peru and Mexico. Manila was also incorporated into the Macau-Nagasaki trading network which allowed Macanese of Portuguese descent to act as trading agents for Philippine Spaniards, use Spanish silver from the Americas in trade with China, and later drew competition with the Dutch East India Company. However, the union meant that Spain dragged Portugal into its conflicts with England, France and the Dutch Republic, countries which were beginning to establish their own overseas empires. The primary threat came from the Dutch, who had been engaged in a struggle for independence against Spain since 1568. In 1581 the Seven Provinces gained independence from the Habsburg rule, leading Philip II to prohibit commerce with Dutch ships, including in Brazil where Dutch had invested large sums in financing sugar production. The Tordesillas boundary between Spanish and Portuguese control in South America was then increasingly ignored by the Portuguese, who pressed beyond it into the heart of Brazil, allowing to expand the territory to the west. Exploratory missions were carried out both ordered by the government, the "entradas" (entries), and by private initiative, the "bandeiras" (flags), by the "bandeirantes". These expeditions lasted for years venturing into unmapped regions, initially to capture natives and force them into slavery, and later focusing on finding gold, silver and diamond mines. The Tamoio were allied with the French since the settlement of France Antarctique and despite the French loss in 1560, the Tamoio were still a threat. The Tamoio launched two attacks in 1561 and 1564 (the latter event was assisting the French), and were nearly successful with each. By this time period, Manuel de Nóbrega, along with fellow Jesuit José de Anchieta took part as members of attacks on the Tamoios and as spies for their resources. 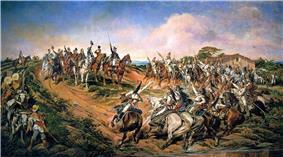 From 1565 through 1567 Mem de Sá and his forces eventually destroyed France Antarctique at Guanabara Bay. He and his nephew, Estácio de Sá, then established the city of Rio de Janeiro in 1567, after Mem de Sá proclaimed the area "São Sebastião do Rio de Janeiro" in 1565. By 1575, the Tamoios had been subdued and essentially were extinct, and by 1580 the government became more of a ouvidor general rather than the ouvidores. Tomé de Sousa built the capital of Brazil, Salvador at the Bay of All Saints in 1549. Along de Sousa's 1000 man expedition were soldiers, workers, and six Jesuits led by Manuel da Nóbrega. The Jesuits would have an essential role in the colonization of Brazil, including São Vicente, and São Paulo, the latter which Nóbrega co-founded. Along with the Jesuit missions later came disease among the natives, among them plague and smallpox. Subsequently, the French would resettle in Portuguese territory at Guanabara Bay which would be called France Antarctique. 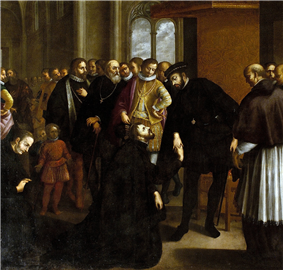 While a Portuguese ambassador was sent to Paris to report of the French intrusion, Joao III appointed Mem de Sá as new Brazilian governor general, and Sá leaves for Brazil in 1557. By 1560, Sá and his forces dispel the combined Huguenot, Scottish Calvinist, and slave forces from France Antarctique, but leave survivors after burning their fortifications and villages. These survivors would settle Gloria Bay, Flamengo Beach and Parapapuan, with the assistance of the Tamoio natives. Of the fifteen original captaincies, only two, Pernambuco and São Vicente, prospered. Both dedicated to the crop of sugar cane and the settlers managed to maintain alliances with Native Americans. The rise of the sugar industry came about due to Crown taking the easiest sources of profit (brazilwood, spices, etc.) that led the settlers to create new revenue. The establishment of the sugar cane industry demanded intensive labor which would be met with native American and, later, African slaves. Deeming the capitanias system ineffective, João III decided to centralize the government of the colony, in order to "give help and assistance" to grantees. In 1548 he created the first General Government, sending in Tomé de Sousa as first governor and selecting a capital at the Bay of All Saints, making it at the captaincy of Bahia. Upon de Sousa's arrival and success, fifteen latitudinal tracts, theoretically to span from the coast to the Tordesillas limit, were decreed by João III on 28 September 1532. These vast lands were donated in form of hereditary captaincies (Capitanias Hereditárias) to grantees rich enough to support settlement, as had been done successfully in Madeira and Cape Verde islands. Each captain-major was to build settlements, grant allotments and administer justice, being responsible for developing and taking the costs of colonization, although not being the owner: he could transmit it to offspring, but not sell it. Twelve recipients came from Portuguese gentry who become prominent in Africa and India and senior officials of the court, such as João de Barros. The increase in brazilwood smuggling from the French led João III to press an effort to establish effective occupation of the territory. In 1531, a royal expedition led by Martim Afonso de Sousa and his brother Pero Lopes went to patrol the whole Brazilian coast, banish the French and create some of the first colonial towns, among them São Vicente, in 1532. Sousa returned to Lisbon a year later to become governor of India and never returned to Brazil. The French attacks did cease to an extent after a retaliation that led to the Portuguese paying the French to stop attacking Portuguese ships throughout the Atlantic, but would continue to be a problem well into the 1560s. 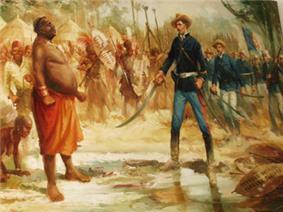 Within a few years after Cabral arrived from Brazil, competition came along by means of France. In 1503 an expedition under the command of Gonçalo Coelho reported French raids on the Brazilian coasts, and explorer Binot Paulmier de Gonneville traded for brazilwood after making contact in southern Brazil a year later. Expeditions sponsored by Francis I along the North American coast was in direct violation of the Treaty of Tordesilhas. 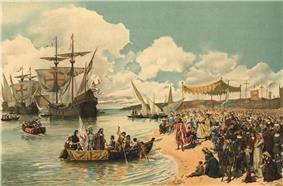 By 1531 the French had stationed a trading post off of an island on the Brazilian coast. Based on the Treaty of Tordesillas, the Portuguese Crown, under the kings Manuel I, John III and Sebastian, also claimed territorial rights in North America (reached by John Cabot in 1497 and 1498). To that end, in 1499 and 1500, João Fernandes Lavrador explored Greenland and the north Atlantic coast of Canada, which accounts for the appearance of "Labrador" on topographical maps of the period. Subsequently, in 1500–1501 and 1502, the brothers Gaspar and Miguel Corte-Real explored what is today the Canadian province of Newfoundland and Labrador, and Greenland, claiming these lands for Portugal. In 1506, King Manuel I created taxes for the cod fisheries in Newfoundland waters. Around 1521, João Álvares Fagundes was granted donotary rights to the inner islands of the Gulf of St. Lawrence and also created a settlement on Cape Breton Island to serve as a base for cod fishing. Pressure from natives and competing European fisheries prevented a permanent establishment and was abandoned five years later. Several attempts to establish settlements in Newfoundland over the next half-century also failed. The Portuguese were defeated in their attempt to capture cities and sultanates, on the Somali coast such as Sultanate of Mogadishu, Merca, and Barawa by the Somalis of the Ajuran Empire. Guarding its trade from both European and Asian competitors, Portugal dominated not only the trade between Asia and Europe, but also much of the trade between different regions of Asia, such as India, Indonesia, China, and Japan. 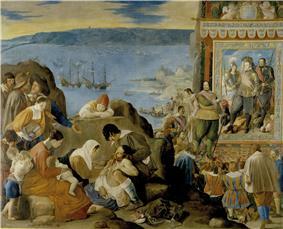 Jesuit missionaries, followed the Portuguese to spread Roman Catholicism to Asia with mixed success. In 1542, Jesuit missionary Francis Xavier arrived in Goa at the service of King John III of Portugal, in charge of an Apostolic Nunciature. At the same time Francisco Zeimoto and other traders arrived in Japan for the first time. According to Fernão Mendes Pinto, who claimed to be in this journey, they arrived at Tanegashima, where the locals were impressed by firearms, that would be immediately made by the Japanese on a large scale. By 1570 the Portuguese bought part of a Japanese port where they founded a small part of the city of Nagasaki, and it became the major trading port in Japan in the triangular trade with China and Europe. In 1534, Gujarat was facing attack from Mughals and the Rajput states of Chitor and Mandu and the Sultan Bahadur Shah of Gujarat was forced to sign the Treaty of Bassein with the Portuguese, establishing an alliance to regain the country, giving in exchange Daman, Diu, Mumbai and Bassein. It also regulated trade of Gujarati ships departing to the Red Sea to pass through Bassein to pay duties and allow the horse trade. After Mughal ruler Humayun had success against Bahadur the latter signed another treaty with the Portuguese to confirm the provisions and allowed the fort to be built in Diu. Shortly afterward, Humayun turned his attention elsewhere and the Gujurats allied with the Ottomans to regain control of Diu and lay siege to the fort. The two failed sieges of 1538 and 1546 had put an end to the Ottoman ambitions, confirming the Portuguese hegemony in the region, as well as having superiority over the Mughals. However, the Ottomans held steadfast to the Red Sea and fought off attacks from the Portuguese in the Red Sea and in the Sinai Peninsula in 1541, and in the northern region of the Persian Gulf in 1546 and 1552. Both entities ultimately had to respect each other's sphere of influence, albeit unofficially. The Portuguese empire expanded into the Persian Gulf as Portugal contested control of the spice trade with the Ajuran Empire and the Ottoman Empire. In 1515, Afonso de Albuquerque conquered the Huwala state of Hormuz at the head of the Persian Gulf, establishing it as a vassal state. Aden, however, resisted Albuquerque's expedition in that same year, and another attempt by Albuquerque's successor Lopo Soares de Albergaria in 1516, before capturing Bahrain in 1521, when a force led by António Correia defeated the Jabrid King, Muqrin ibn Zamil. In a shifting series of alliances, the Portuguese dominated much of the southern Persian Gulf for the next hundred years. With the regular maritime route linking Lisbon to Goa since 1497, the island of Mozambique became a strategic port, and there was built Fort São Sebastião and a hospital. In the Azores, the Islands Armada protected the ships en route to Lisbon. The Portuguese operations in Asia did not go unnoticed, and it did not take long for Magellan to arrive in the region only several years later and discover the Philippines for Spain, which in turn gave rise to the Papal Treaty of Zaragoza. 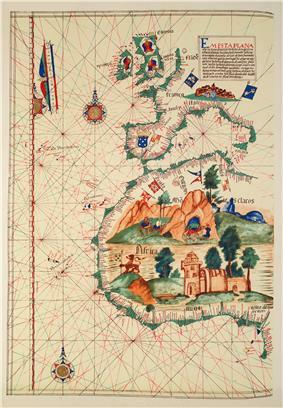 In 1525, after Magellan's expedition (1519–1522), Spain under Charles V sent an expedition to colonize the Moluccas islands, claiming that they were in his zone of the Treaty of Tordesillas, since there was not a set limit to the east. García Jofre de Loaísa expedition reached the Moluccas, docking at Tidore. The conflict with the Portuguese already established in nearby Ternate was inevitable, starting nearly a decade of skirmishes. An agreement was reached only with the Treaty of Zaragoza, attributing the Moluccas to Portugal and the Philippines to Spain. As Portugal increased its presence along China's coast, they began trading in slaves. Many Chinese slaves were sold to Portugal. Since the 16th century Chinese slaves existed in Portugal, most of them were Chinese children and a large amount were shipped to the Indies. Chinese children were kidnapped in China, and through Macau were brought to Portugal and sold as slaves either in Macau or overseas. Chinese prisoners were sent to Portugal, where they were sold as slaves, they were prized and regarded better than moorish and black slaves. 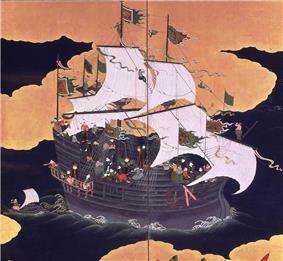 Portuguese pirating was second to Japanese pirating by this period. However, they soon began to shield Chinese junks and a cautious trade began. In 1557 the Chinese authorities allowed the Portuguese to settle in Macau, creating a warehouse in the trade of goods between China, Japan, Goa and Europe. The Chinese responded by killing multiple Portuguese in Canton and drove the Portuguese back to sea. After the Sultan of Bintan detained several Portuguese under Tomás Pires, the Chinese then executed 23 Portuguese and threw the rest into prison where they resided in squalid, sometimes fatal conditions. The Chinese then massacred Portuguese who resided at Ningbo and Fujian trading posts in 1545 and 1549, due to extensive and damaging raids by the Portuguese along the coast, which irritated the Chinese. In spite of initial harmony and excitement between the two cultures, difficulties began to arise shortly afterwards, including misunderstanding, bigotry, even hostility. The Portuguese explorer Simão de Andrade started bad relations with China, due to his pirate activities, raiding Chinese shipping, attacking a Chinese official and kidnappings of Chinese. He based himself at Tamao island in a fort. The Chinese claimed that Simão kidnapped Chinese boys and girls to be molested and cannibalized. The Chinese sent a squadron of junks against Portuguese caravels: succeeding and driving the Portuguese away and reclaiming Tamao. As a result, the Chinese posted an edict banning men with caucasian features from entering Canton. The Portuguese empire pushed further south, and proceeded to discover Timor and  In 1512, João da Silveira commanded a fleet to Chittagong in the Sultanate of Bengal. The Portuguese settlement in Chittagong was established in 1528. The peninsula of Malacca became then the strategic base for Portuguese trade expansion with China and South-east Asia. To defend the city was erected a strong gate which, called the A Famosa, still remains. Knowing of Siamese ambitions over Malacca, Albuquerque sent immediately Duarte Fernandes on a diplomatic mission to the Kingdom of Siam (modern Thailand), where he was the first European to arrive, establishing amicable relations between both kingdoms. Portugal discovered Thailand and established Western trade with the nation. In April 1511 Albuquerque sailed to Malacca in Malaysia, the most important east point in the trade network where Malay met Gujarati, Chinese, Japanese, Javanese, Bengali, Persian and Arabic traders, among others, described by Tomé Pires as of invaluable richness. The initial capture of Goa from the Bijapur sultanate in 1510 was soon countered by the Bijapuris, but with the help of Hindu privateer Timoji on November 25 of the same year it was recaptured. Soon Albuquerque began that year in Goa the first Portuguese mint in India, encouraged Portuguese settlers to marry local women, build a church in honor of St. Catherine (as it was recaptured on her feast day), and attempted to build rapport with the Hindus with protecting their temples and reducing their tax requirements. The Portuguese maintained friendly relations with the south Indian Emperors of the Vijayanagara Empire. By the end of 1509, Albuquerque became viceroy of the Portuguese India. In contrast to Almeida, Albuquerque was more concerned with strengthening the navy, as well as being more compliant with the interests of the kingdom. His first objective was to conquer Goa, due to its strategic location as a defensive fort, its positioning between Kerala and Gujurat, as well as its prominence for Arabian horse imports. However, such posts were centralized by Afonso de Albuquerque after his succession and remained so in subsequent ruling.